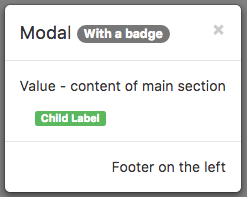 A Modal control displays a panel of information above your app. It can contain a header, detail or footers. By default, it is hidden, so it cannot be seen in the Design Screen. It needs to opened using its toggle function. Since it does not display on the Design Screen, it can be difficult to edit. There's an easy solution. Add 'display:block' to the style attribute. Don't forget to remove it when you are done. Make it the bottom control in the list of controls in the Project Explorer. That will it will float over the other controls without affecting their placement. Keep its width set to 'auto'. Bootstrap will size it properly. Do not set the screenMode of the containing Form to Zoom. footer The text on the bottom. Leave blank for none. HTML is allowed. In Bootstrap 4, aligned right. Design Time and Runtime. footerAlign Alignment of footer contents. left, center or right. Design time. header The heading in the control. Leave blank for none. HTML is allowed. Design Time and Runtime. size Size of Modal control. small, medium or large. 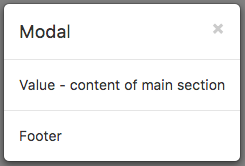 toggle() Show or hide the Modal panel. value The text in the center of the control. Leave blank for none. HTML is allowed. In Bootstrap 4, text will scroll if needed. Design Time and Runtime.